I'll also be using this Bleeding Diamonds blog to post about music and art I'm digging at the moment. Tour stories and photos. Who knows, maybe the band will post some soup recipes. Theres a lot of good ones at the moment. The Art of Swedish Record Making. I'm in Sweden working with my good old pal, Tore Johannson, who we remember last time as the producer of my first record 'Neptune City." The studio is called Kong and looks like something straight out of Fraggle Rock. It's going really well so far. Listening to lots of Peter Gabriele and Eric Burdon for inspiration and eating lots of soup. You should see the magpies out here. They're outstanding. Stone Pony show August 4th! 2 Shows for the New Year! 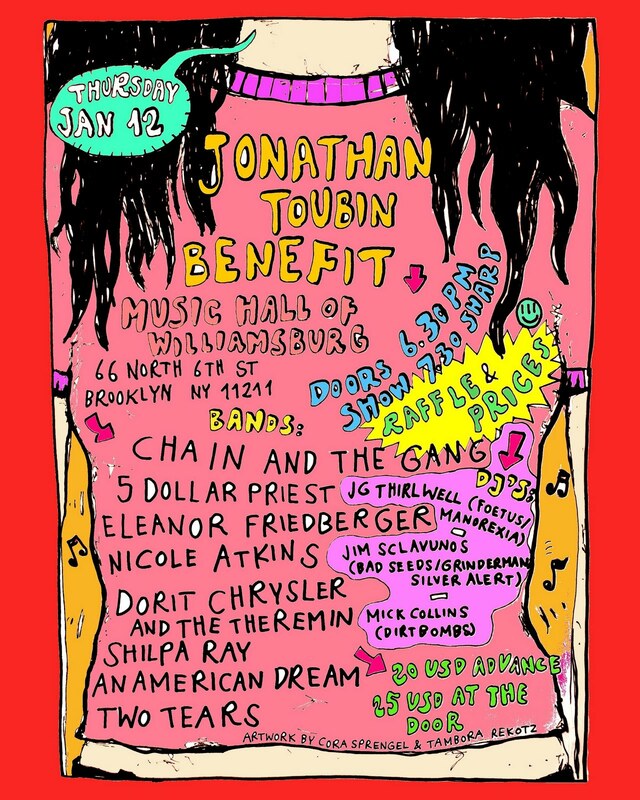 Jonathan Toubin Benefit and the Grand Opening of The Press Room in Asbury Park! This month I'll be playing two shows. 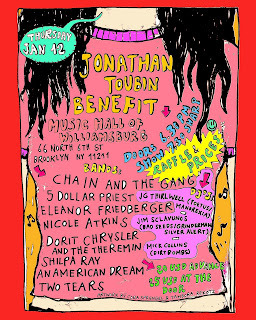 The first show is a benefit for my friend Jonathan Toubin. Jonathan is an amazing soul DJ, an important part of the NYC music scene and a great friend. He was injured in a severe freak accident last month while at a hotel in Portland. His condition is quite fragile but he is responding well to his surgeries. As you can imagine, his medical bills are going to be astromical so there are many benefits being thrown in order to help him. The one I'm playing at with my band, the Black Sea, will be January 12th at the Music Hall of WIlliamsburg. The flyer is attached and the entire bill is amazing. I hope to see you guys there. This show is only $10 and tickets are only available at the door on a first come first serve basis, so spread the word and show up around 7:30. 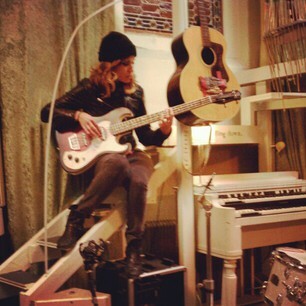 I'm currently writing my third record... AHHH! so maybe you'll hear a few new guys! Yay! Happy holidays to you and yours. I hope this year has been a total blast for all ya'll. I know it has been for me. Thanks to all of you who bought "Mondo Amore," and came out and partied with us at the shows. We had such a fantastic time touring this record with our buddies the Black Keys and the Avett Brothers, and then doing our own shows and also, my first little solo tour. Seriously, you guys are the blood and gasoline that keep us running and we couldnt be more grateful to get to play these songs for you all. Good News... my new video for "Hotel Plaster," premiers tomorrow (Friday) via our good friends over at www.rollingstone.com! Check it out! It was directed by the supernaturally talented Mandy Bisesti and stars members of the Black Sea and my roomates, the Ragolia twins. Its a trip down the rabbits hole filmed in the deep dark woods. I hope you guys love it as much as we enjoyed making it. Please share the video, Retweet it, facebook it, messenger pigeon it, etc. We've got Mondo Amore vinyl and cds, Signed limited edition posters and tshirts over at www.nicoleatkins.com for awesome holiday gifts for your loved ones. Get some! Finally, thanks again for a stellar year with you all out on the road. I'm locking myself away for a couple months to write another album for you all to enjoy. Blessings and tidings to you and yours!